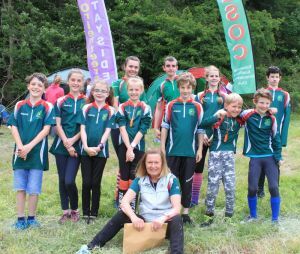 ESOC juniors once again attended the Jamie Stevenson Trophy (JST), which this year was held on Sunday 25th June at Kinnoull Hill, near Perth. 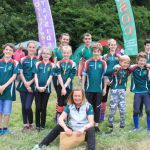 The JST is an annual event for teams of juniors from Scottish orienteering clubs. 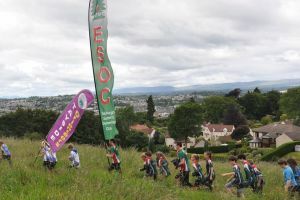 Kerry led ESOC juniors in the traditional parade of club teams before the event - see 2nd photo below (taken by MAROC). ESOC were 8th, with 551 points; the winners, with 596 points, were MAROC. This is an impressive ESOC performance. Although a small team and up against much larger clubs, ESOC showed great team spirit and made a very good contribution to the event. The results are now on the Scottish Orienteering Association (SOA) website. Well done to all for successfully completing your courses, some of which were quite tricky, and particularly to our 6 counters: Rachel, Jamie, Katie, Luke, Kerry and Joseph. Well done to all. Thanks especially to Maureen for organising the ESOC contingent.